Navigating the gluten-free lifestyle with kids is no easy feat. The fear and social anxiety of having to feel “different” at a party is enough to contend with. You DO NOT have to miss out on ANY birthday parties, class parties and social events for being gluten free. 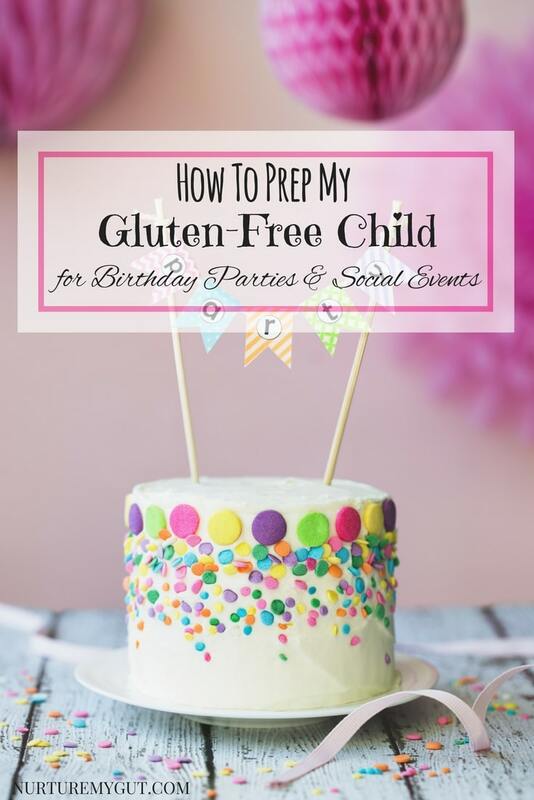 For the last 7 years, I have developed a successful system for prepping my gluten free kids for events and we have never missed a party due to dietary restrictions. It takes planning and preparation on behalf of the parents, specifically the Mother and it is all do-able! I am going to walk you through the prepping and planning of these events so that you can get there and have fun! Your child and family will not have to miss out on any of the fun! 1) Call the host to find out what they will be serving. I say “Thank you so much for the invitation, ______ is very excited to be there and celebrate with you. As you know, _______ has food allergies. I would like to bring him/her something similar to what you will be serving. 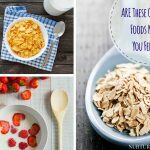 Would you mind letting me know what type of food, snacks and dessert you will be serving ahead of time so that I can have something similar for my child?” Mothers are usually very helpful. 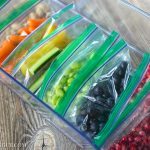 This also helps Moms get their menu prepped if they are used to running around at the last minute. Be sure to mark your calendar with reminders to yourself for enough time to bake, make or pick up food. The same goes for class parties, talk to the teacher after school days before the event so you have time to prepare. 2) Bake cupcakes with your child and have them test the recipe so they know what they are getting is yummy and they feel like they chose their dessert. I let my kids know what cake will be served and ask them if they would like the same flavor in a cupcake. Usually my kids choose chocolate cupcakes with chocolate frosting because that is their favorite. We love using Xo Baking Co. chocolate cake mix or Pamela’s Chocolate Cake Mix. For a cake from scratch, we use my Best Gluten Free Chocolate Cupcakes Recipe. 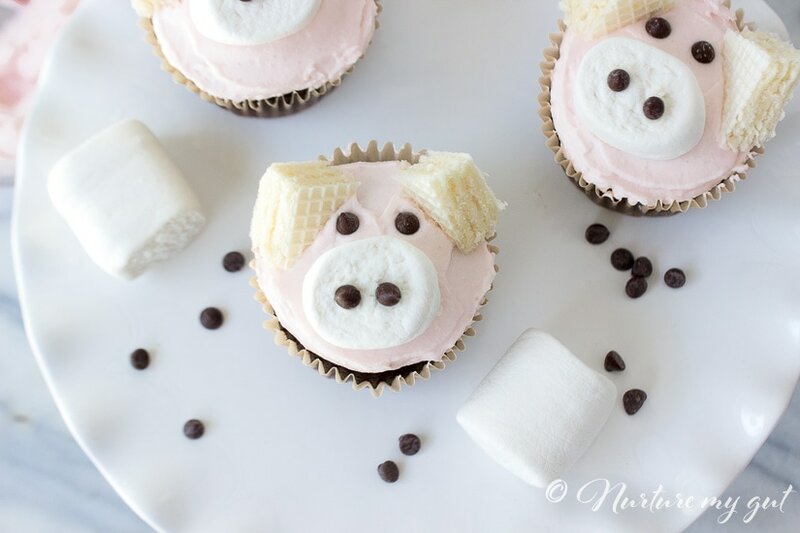 I also have an adorable Gluten Free Pig Cupcakes Tutorial that is perfect for a kids Charlotte’s Web Birthday themed party. Before the party, I bake a dozen or so cupcakes, let them cool and wrap them individually in plastic wrap. Then, I freeze the wrapped cupcakes in heavy duty zip-lock freezer bags. They stay fresh for up to 3 months. You can even make a dozen vanilla cupcakes and a dozen chocolate cupcakes ahead of time. A Foodsaver storage system will keep your frozen cupcakes fresh longer, use these zipper bags and only take out enough air so as to not smash the cupcakes. If I have a last minute party, then I run to Trader Joe’s and get their gluten free cupcakes which are fresh and yummy. 3) The day of the party, defrost your cupcake and make the frosting. For successful transport. I suggest my Vegan Buttercream, Vegan Chocolate Buttercream Frosting or Easy Raspberry Vegan Frosting. They can handle some jiggling and heat. Next, you want to make your cupcakes look pretty. Yes, this is important. Once I began to do this, my kids really shined when their cupcakes were served. They got lots of compliments from their friends and felt special. Here is a simple tutorial below for making pretty rosettes on cupcakes. I use a Wilton 1M Star Tip and a Wilton 12-Inch Featherweight Decorating Bag . They are re-usable and cost less than $10 for both. Refrigerate your decorated cupcakes in a tupperware or Individual Cupcake Container until party time. Bring your cupcake container in a small cooler or grocery bag. Be sure they do not tip over. I usually add an ice pack to my cooler bag. 4) After you find out what food will be served, give yourself enough time to get it ready. In Los Angeles, pizza is served at 98% of birthday parties. I go to Blaze Pizza and pick up an individual pizza for each of my children and that works fine. They have special procedures for those with food allergies. When time allows, I make my own gluten free pizza, wrap it in aluminum, put it in a tupperware and bring it in a hot bag to the party. If there will be goldfish or other snacks, ask your child what he would like instead, fresh fruit, crackers, etc? My kids like Pirate Booty and there is gluten free goldfish available at Target. 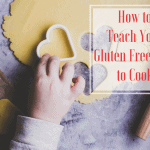 Let your child know that you will be serving all his/her food at the party and to be sure to ask you before grabbing any snacks to make sure they are gluten free. 5) At the party, you want to be ready with your plate and bags when the kids are being served. When I see that the host is serving the main dish, usually pizza, I get a party plate, put our gluten free pizza on a plate and serve it to my child while the other kids are being served. There is rarely a difference in food. Then, when the cake is being served, I put a cupcake on a plate and serve it to my child. They are very happy that they don’t have to wait so long to get their dessert. Be quick, as soon as that first slice of cake is served, give your child their dessert. Phew! You did it! 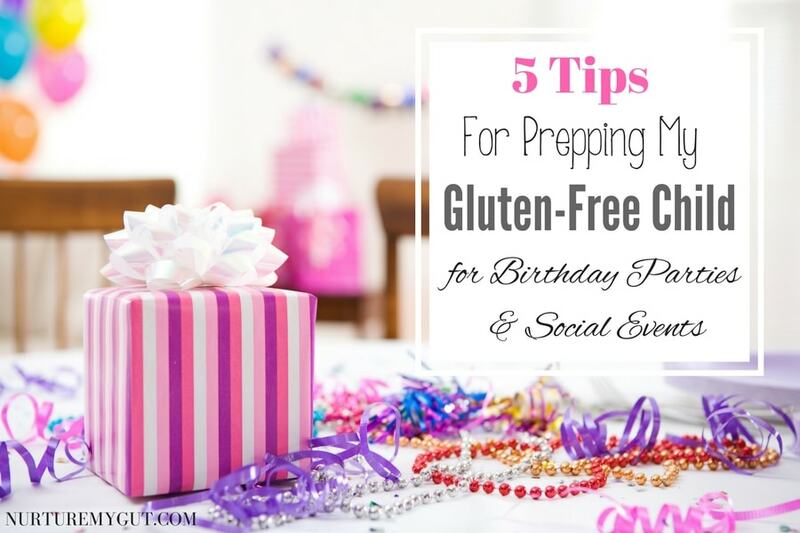 Now that you have learned how to prep your gluten-free child for birthday parties and social events, your child NEVER has to miss out on parties again! You are ahead of the game and ready to go for any party or holiday! 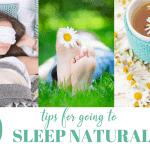 These tips have worked out for us for over 7 years my family still uses them! They have kept us socially active and my kids health safe. 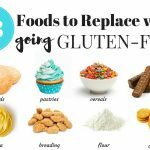 Your gluten free kids can have fun at parties and should NEVER have to miss out due to dietary restrictions! Now that you have a proven action plan in place, you can relax and have fun! 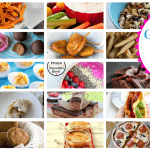 For delicious healthy kid friendly gluten free recipes, please subscribe below. You will get my free Paleo Breakfast E-Book as my gift to you and new recipes straight to your inbox!